The construction was completed in 1936, by the design of Aleksandar Đorđević. The palace was renovated immediately after World War II. It was finally arranged and equipped for present purpose at the same time with the Old Palace (architect Bratislav Stjanović and his team). The complex of palaces, arranged as an integral space, serves for residential purposes. The building for the Railway Station was constructed in 1884, on a reclaimed area of what used to be the "Bara Venecija" (Venice pool). It was made by the ideas of the Viennese architect von Schlicht and the plans of the architect Dragutin Milutinović, the professor at the Faculty of Engineering of the Great School in Belgrade. In that time, it represented a very successful solution, by the harmony of architectural forms (in the manner of classical architecture) as well as by spatial organization. It is in the group of architectural projects which, in the Principality and later Kingdom of Serbia, represented the first acceptance and development of technical achievements of Europe of that period. The oldest Belgrade restaurant, built in 1823 as a property of Knez Miloš Obrenović, gifted to Naum Ičko, his commercial consul. It was constructed by the Greek builders in the Balkan style. As soon as 1826, on the ground floor of this building, Ećim-Toma Kostić, the son-in-law of Naum Ičko and a famous healer from the Second Serbian Insurrection (he cured Knez Miloš, too), opened a cafe called "Ećim-Tomina". Since 1878, when it was sold by the successors, it has changed its owners and names. First it was called "Kod pastira" (At Shepherd's) in 1878, then, in 1892 "Kod Saborne crkve" (At the Cathedral Church), but this was soon removed, because it neither complied with regulations on restaurants, nor did the Church authorities find it suitable. As a temporary solution, the owner has put up just a question mark, which has remained until today. Vuk Karadžić used to come to this restaurant in 1830-1831. In 1834 it had the first billiard table in Belgrade, and since the same year, i has been the first reading-room of "Srpske Novine" (Serbian Newspaper). Built in the middle XIX century as a residence and restaurant of the merchant Manak Mihailović, born in Macedonia, in the time of construction of new streets of Savamala. By its age, location and picturesque look, the house is an evidence of the last traces of Balkan architecture of the time when Belgrade began to overgrow its margins and develop into a modern European city. 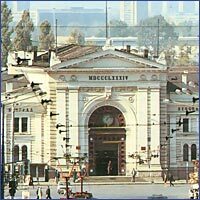 After a radical repair in 1966, it is the place of the Club of Collectors and the Club of the Devotees of Old Belgrade. There is also a collection of ethnographical objects by professor and painter Hristifor Crnilović. The building belongs to the Museum of Ethnography. This monument was erected in 1896 to mark the 1000th anniversary (896-1896) of the founding of the Hungarian state (The Hungarians have built other such millenary monuments elsewhere, too). The present tower was constructed of stone and brick as a "vidikovac" or viewing tower on the summit of Gardoš Hill. Its architecture shows different styles, with romantic elements predominating. It has been wrongly connected with the historical personality of Janos Hunyadi, also known as Sibinjanin Janko. Today the tower is the place of various cultural activities.